The mini-tyrant and I had a very exciting morning. 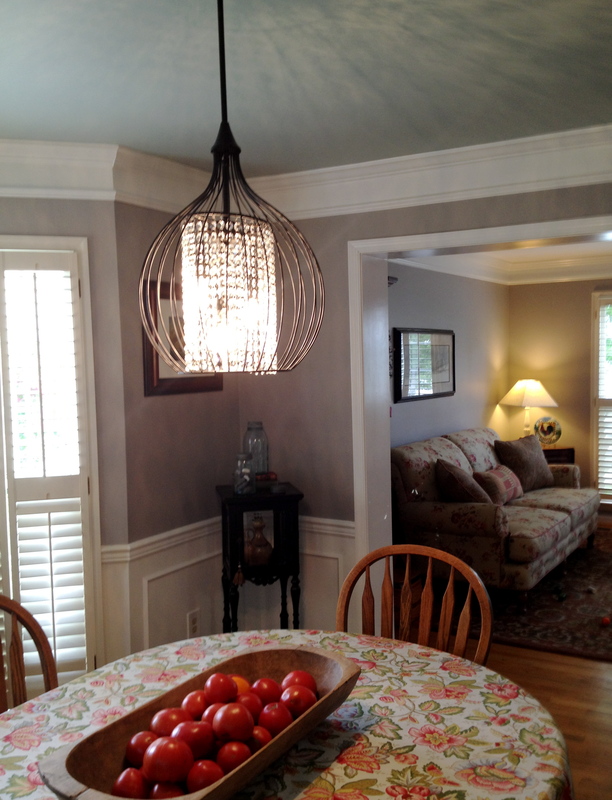 After sipping coffee together and throwing some blocks around, we photographed a finished dining room. 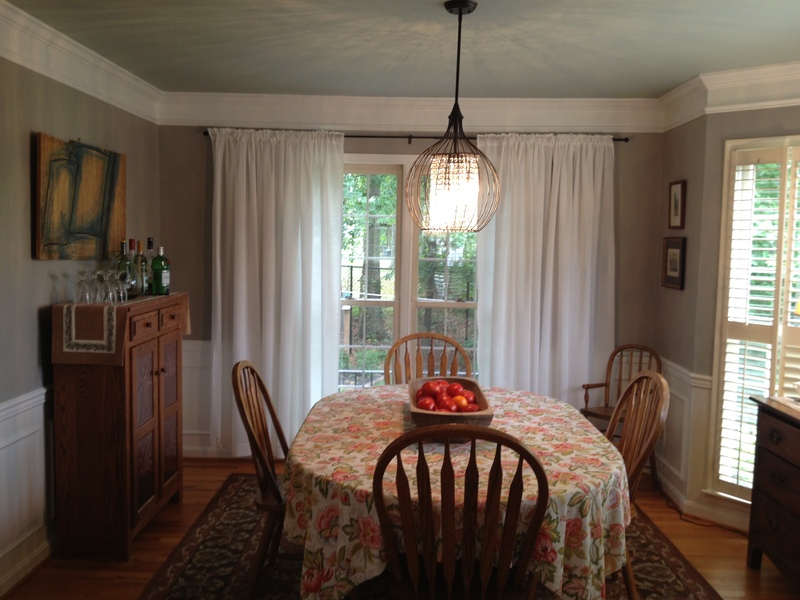 A dining room that we helped create. 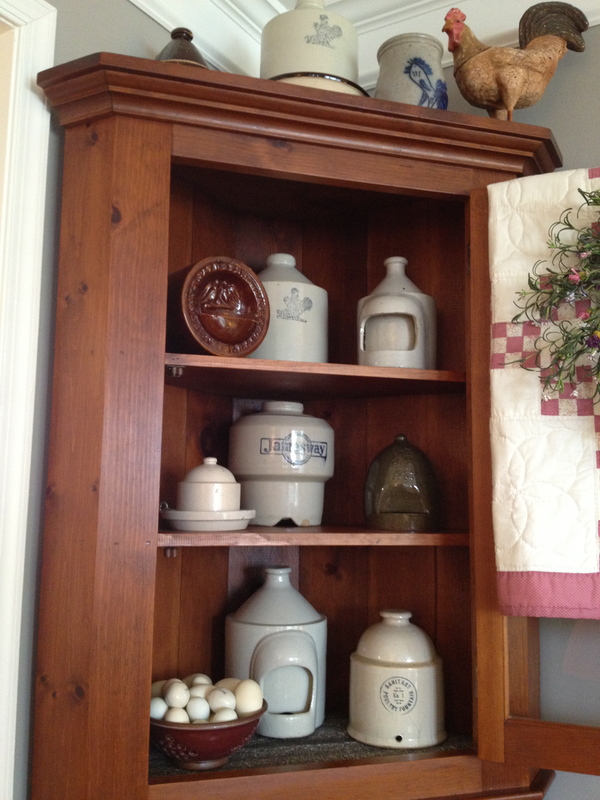 It started with talk of paint colors, admiring the old chicken-feeder collection, and snowballed into cashing in some old savings bonds. I worked with her existing furniture and drew her out of her comfort zone. A little at a time, we watched the room transform and got more excited as it went along. 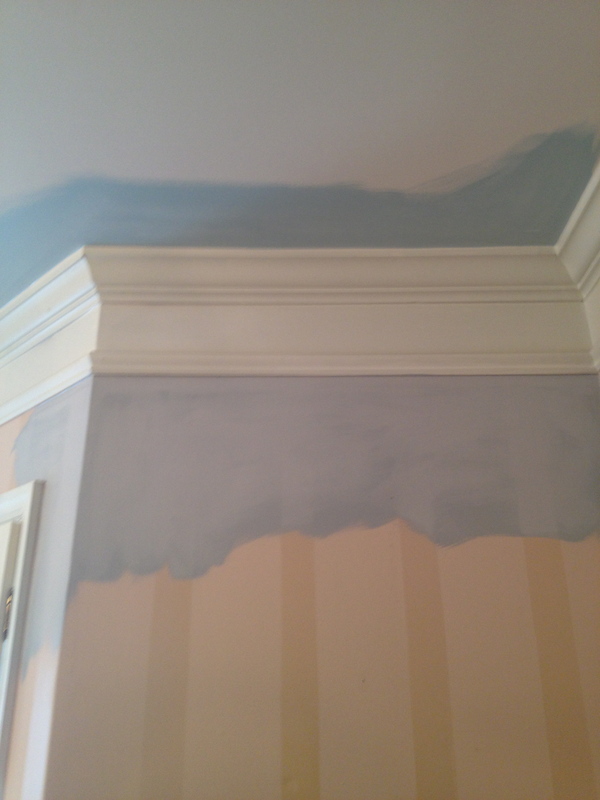 The ceiling is a beautiful blue, Benjamin Moore’s Sylvan Mist and the walls gray, Benjamin Moore’s Museum Piece. 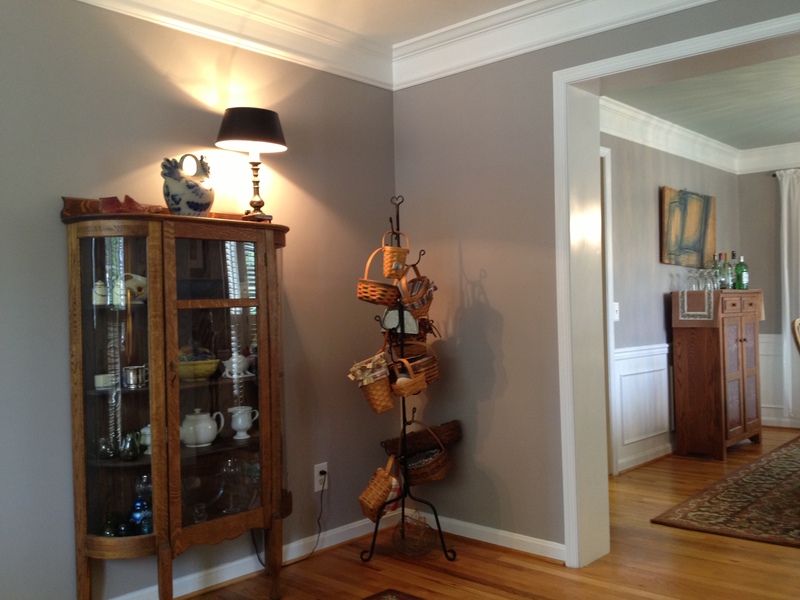 The wall color is hard to define…. A little lavender, a little taupe or gray, depending on the light. Testing out the paint colors. To be fair, my kids were playing with the play-doh. 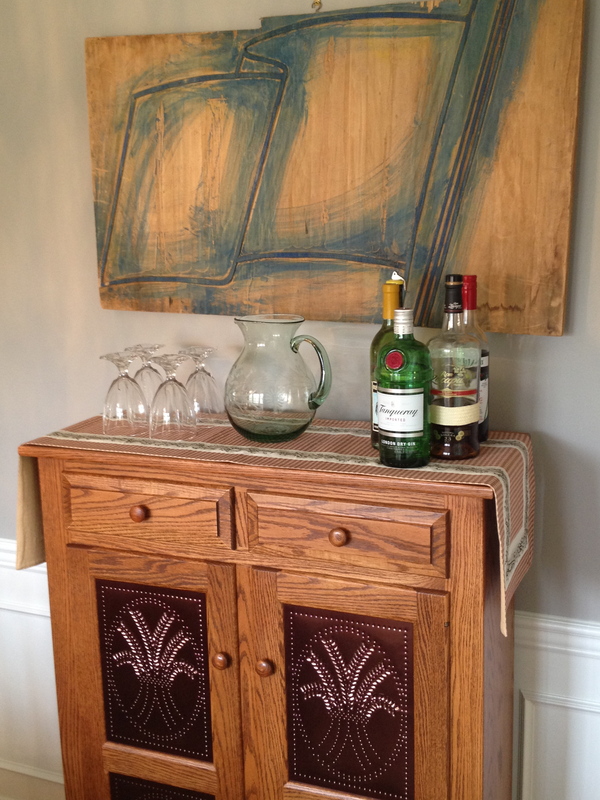 We rearranged the furniture and the homeowner was then inspired to hang some art she had hidden in the basement. A fabulous old woodcut block print of a flag with blue accents, which she hung above the pie safe. I cannot believe this treasure was hiding out in the basement! 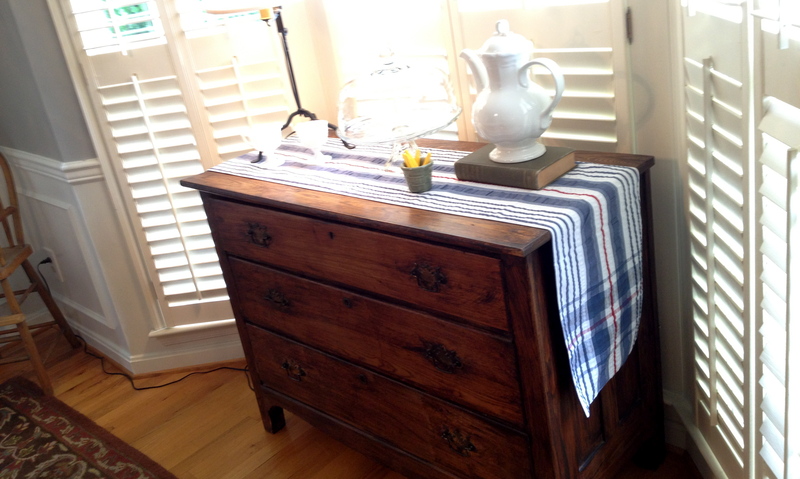 Antique dresser, in the bay window. We brainstormed about the light fixture and I eventually convinced her it needed to sparkle. 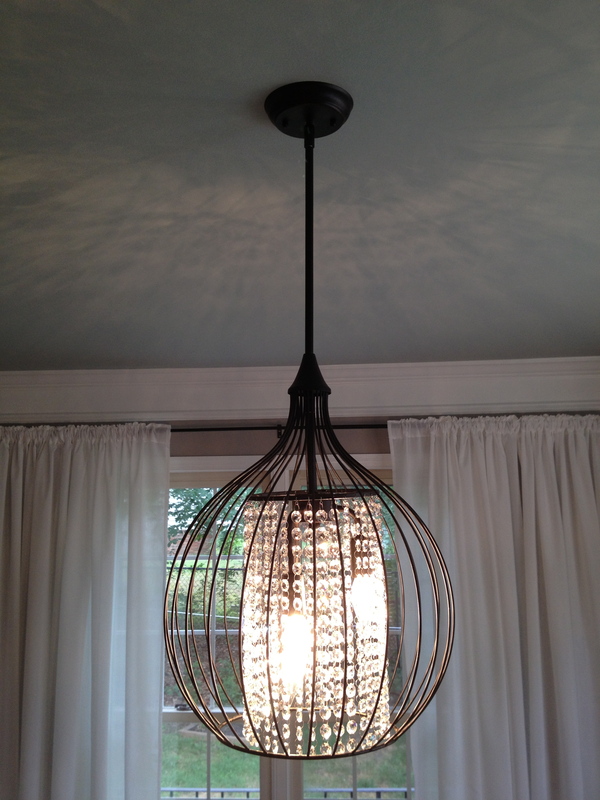 She chose the contemporary light, which adds drama with whimsical shadows, and has a black finish that is elegant. She had to have the chandelier re-centered over the table, because originally the chandelier was installed about 18 inches off-center. This would have caused me to twitch. The new chandelier sparkles, and brings just the right amount of crystal bling into the room, and now, it is even centered. 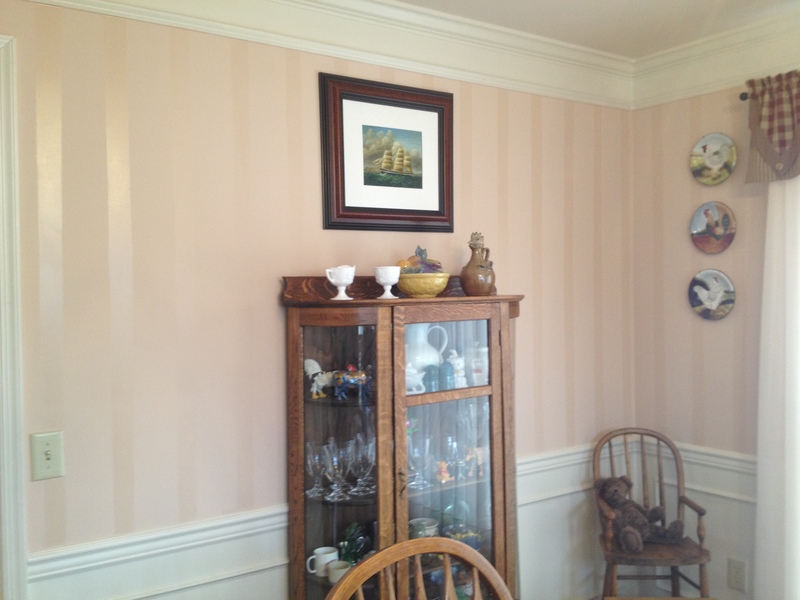 The adjacent living room was also painted Benjamin Moore’s Museum Piece. This keeps the rooms connected and feeling open. 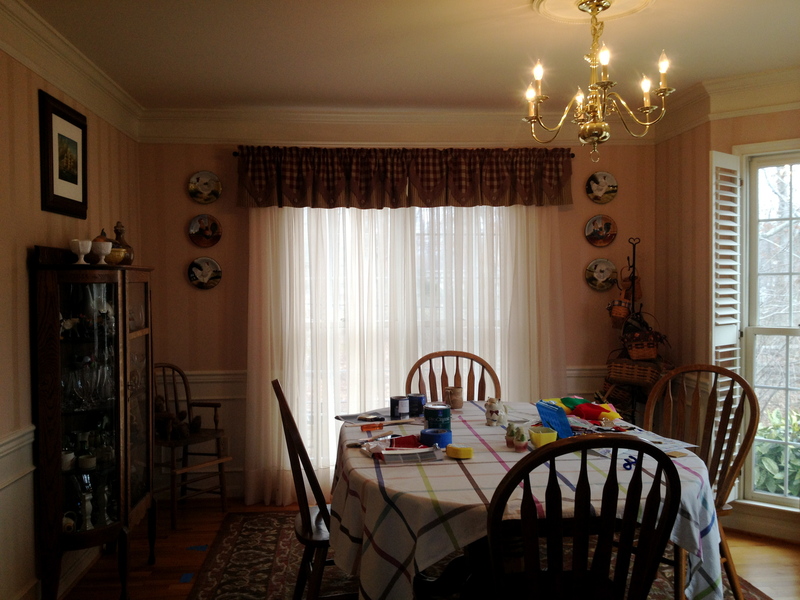 She added white sheer curtains and painted all of the trim a crisp white. These rooms now look fresh and clean, traditional, but with a hint of the unexpected. The adjacent living room is updated and the whole space looks pulled together. It reflects the homeowners’ personalities completely. Traditional with a pop of the unexpected. Here’s to basements full of hidden treasure, and to friends willing to step out of their comfort zone. Cheers!